Install Android 9.0 Pie on Moto G 4G (peregrine) using Lineage OS 16 custom ROM. Download and update Motorola Moto G 4G smartphone to latest, stable Lineage OS 16 custom firmware. Unfortunately Motorola Moto G 4G will never receive an official Android 9.0 Pie update from the company. So the only option to experience it is by flashing third party custom ROMs. The ROM which we’re going to discuss today is the well known Lineage OS 16 ROM. 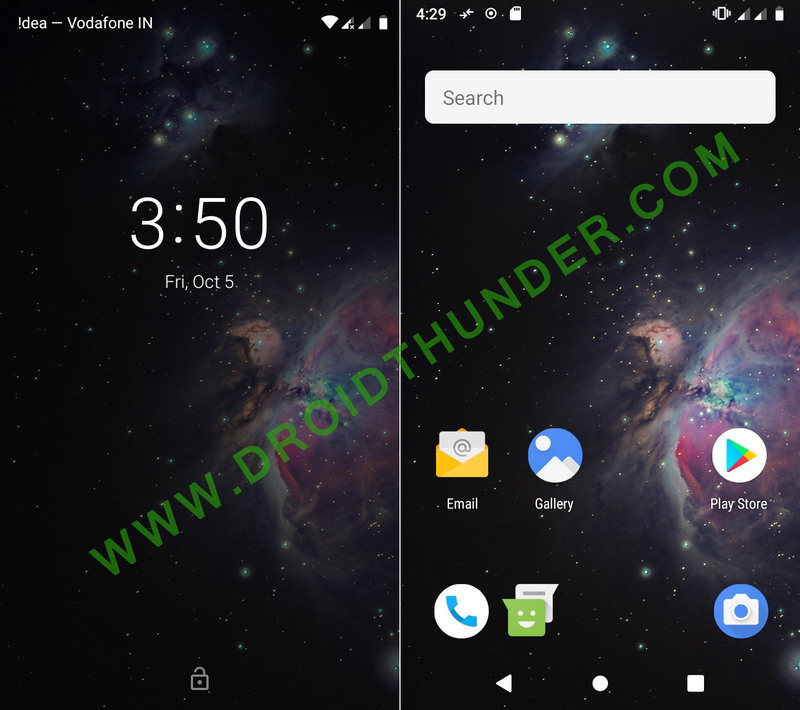 Yes powered by the latest Android 9.0 Pie, this firmware is filled with some amazing features and customization options which will make your day. Install Android 8.0 Oreo based Lineage OS 15 ROM on Moto G 4G. 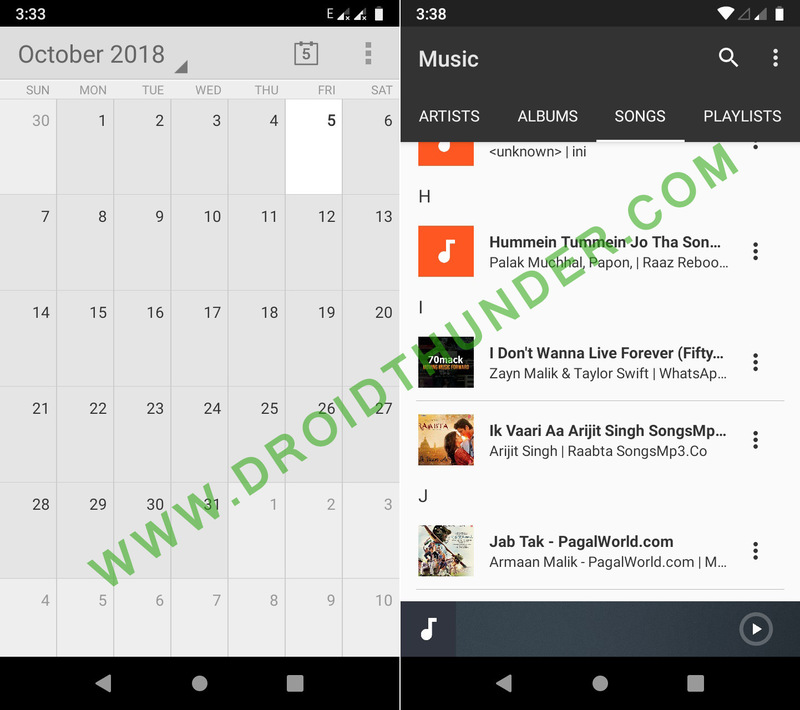 To enjoy Android Pie on Moto G 4G, Allstargaurav, a recognized developer has developed the Lineage OS 16 custom ROM. It is a fully customizable and tweaked firmware that’ll give a complete feel of Android Pie on Moto G 4G. This way you can enjoy and experience the latest Android 9 Pie on Moto G 4G. 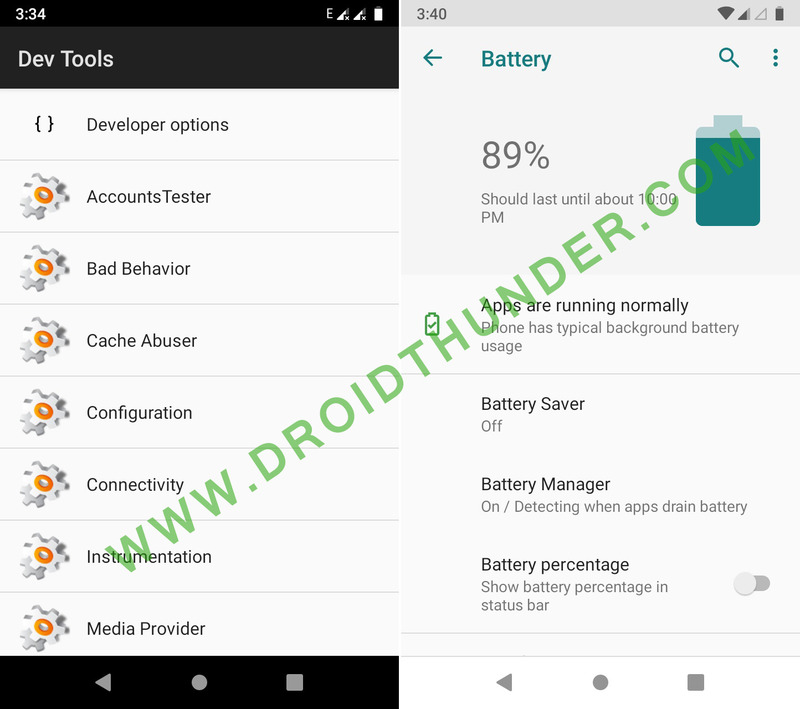 If you’re looking for some extra power, increased battery life performance and a redesigned web browsing experience then yes this is the ROM for you. Some of the features include new user interface, enhanced auto fill, multi camera API, adaptive battery with AI support, new notification panel, revamp to quick settings, swipe gesture navigation, smart replies, manual theme selection, app actions, adaptive brightness and text selection. So without wasting your precious time go ahead and flash this Android 9.0 Pie on Moto G 4G. 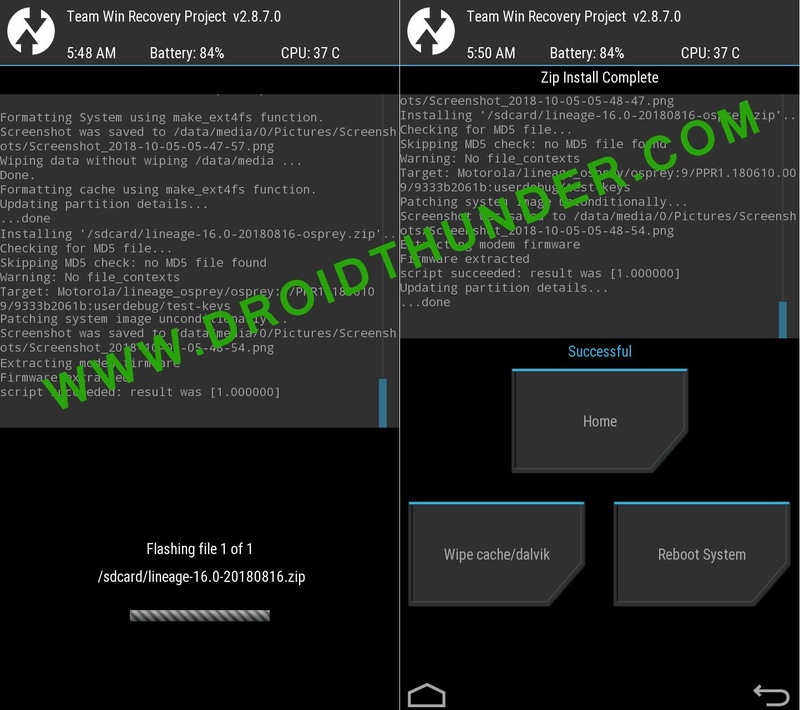 Note that this custom ROM is still in its initial stage, so there are chances of few bugs or issues. But don’t worry, with further updates all those issues will be wiped. 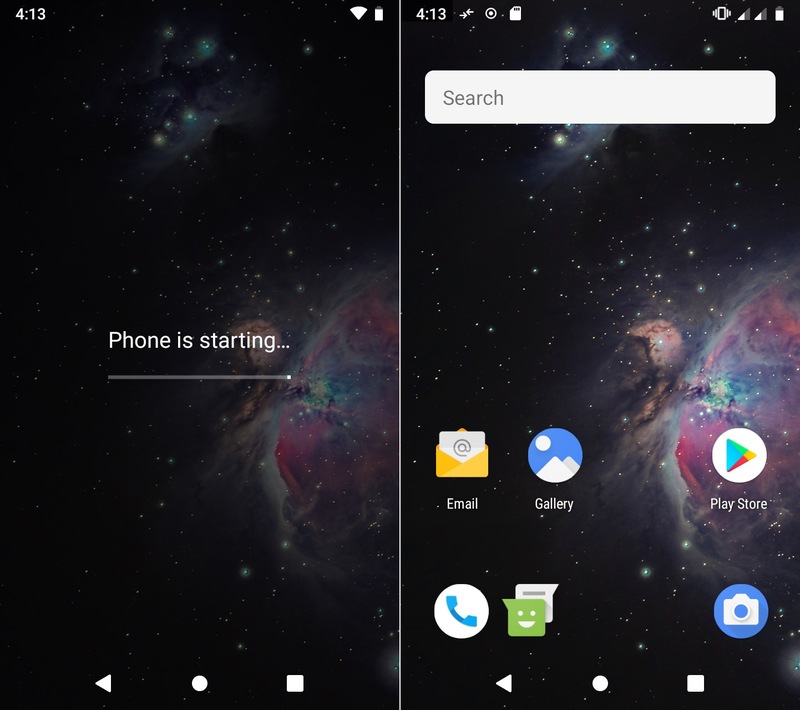 Those who wish to update their devices to Android 9.0 Pie using LineageOS 16 ROM, may follow our step by step guide given below. Flash this Android 9.0 Pie on Moto G 4G at your own risk. 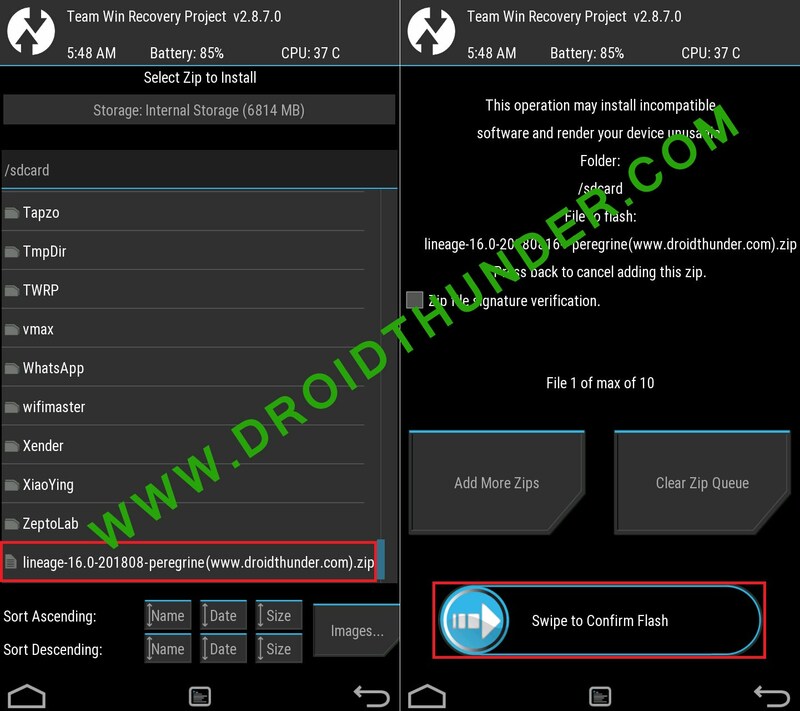 We at DroidThunder.com will not be held liable for any damage caused to your device. So we recommend to follow all the instructions correctly without performing anything by your own. 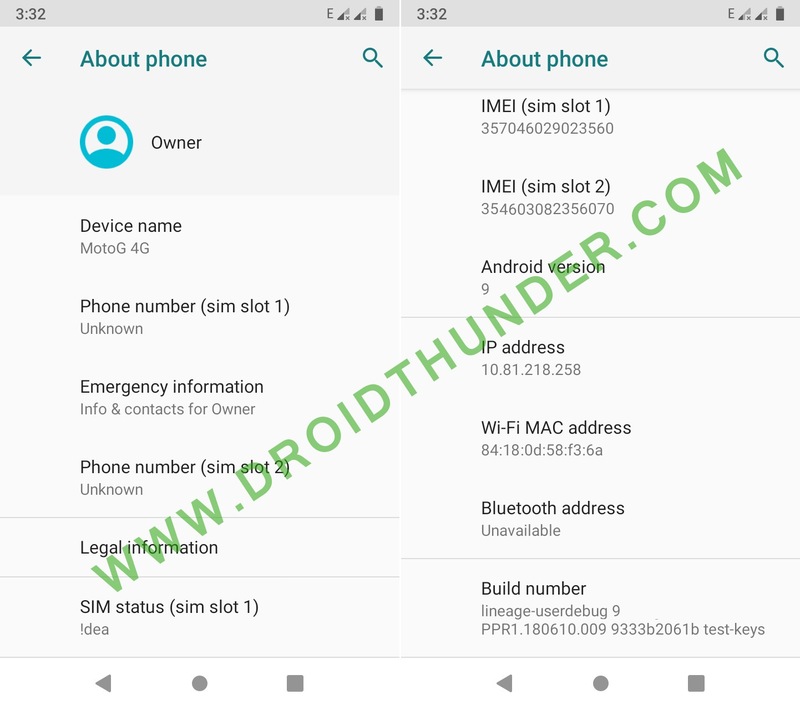 This Android 9.0 Pie based Lineage OS 16 ROM must be installed only on Motorola Moto G 4G (peregrine) . 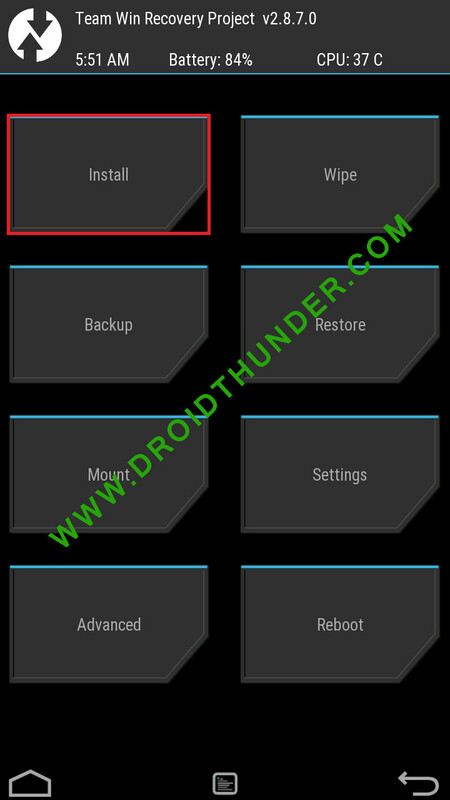 Do not flash this custom ROM on any other device as it might brick your phone. Confirm your device before moving further. Ensure that your phones battery is charged at least up to 60% so as to minimize the risk of interruption during the installation process. 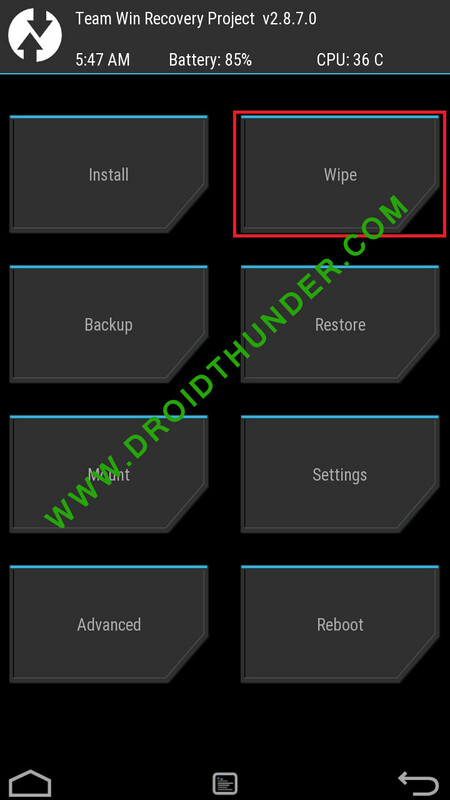 Flashing a ROM involves wiping of entire phone memory. So backup all your important data such as Contacts, SMS / MMS, Apps, APNs, Call logs and Memos etc. Install Motorola USB drivers on your PC. This is essential so as to detect your phone when connected to computer. You can manually install the drivers from the link given below. 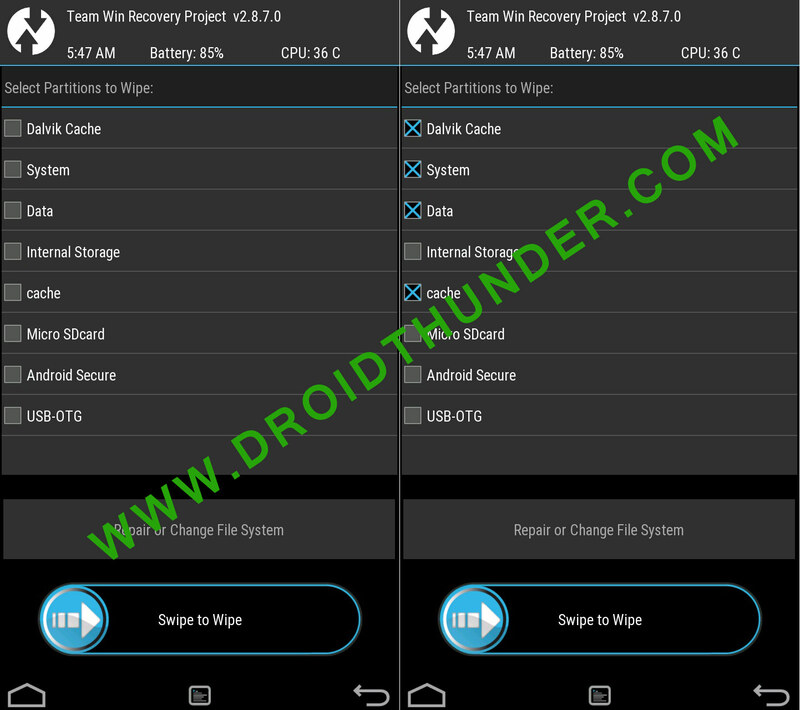 How to Root & install TWRP recovery on Moto G 4G. 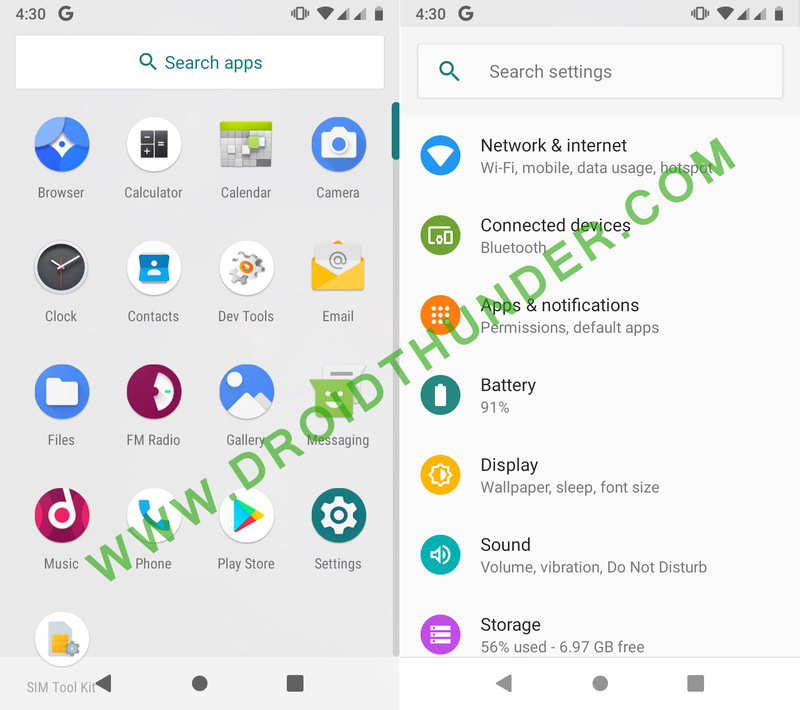 Download Android 9.0 Pie based LineageOS 16 ROM for Moto G 4G. Step 1: Download both the zip files on your computer. Step 2: Then connect your phone to PC and copy both the files on your phones internal memory. Step 3: Now switch off your Moto G 4G completely until it vibrates. 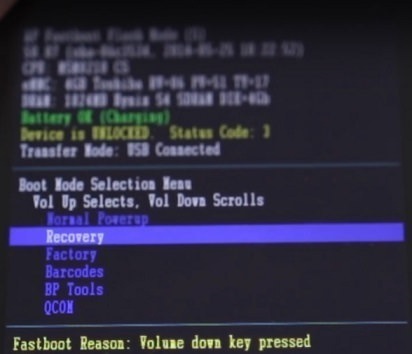 Step 4: Restart your phone into bootloader mode. 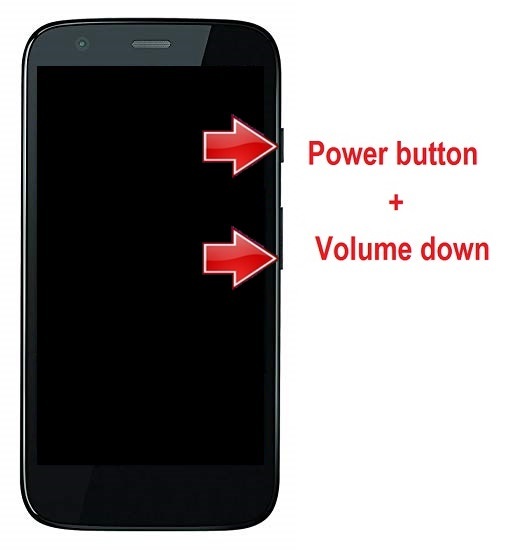 For doing so, press and hold Volume down key + Power button simultaneously until you land into bootloader mode. 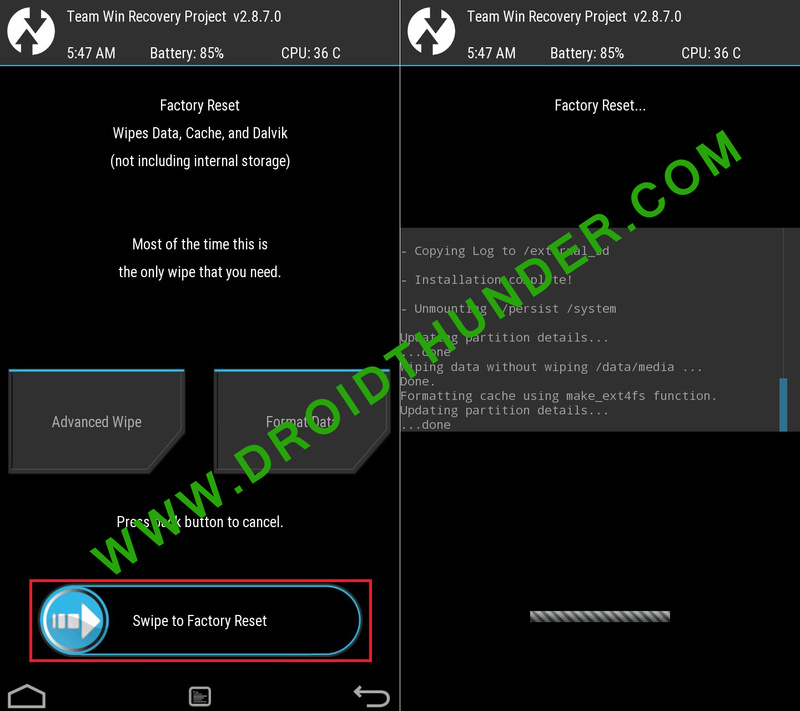 Note: In bootloader mode you can perform various operations like normal powerup, enter recovery mode, start bootloader mode, factory reset etc. Volume down button is used for scrolling and Volume up for selection. Step 5: Use Volume down key and navigate to Recovery mode option and select it using Volume up button. 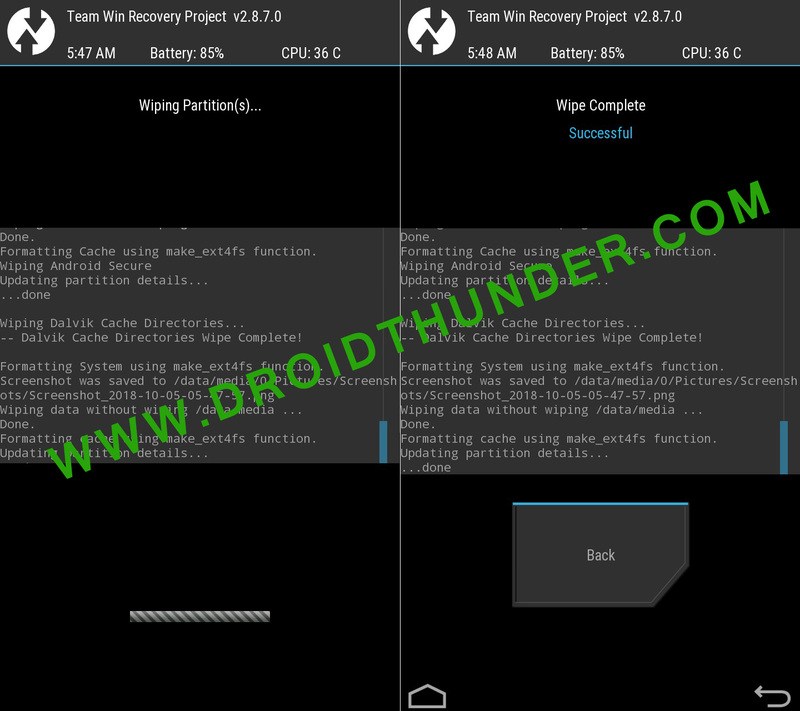 Step 6: As soon as you hit the volume up button your phone will boot into TWRP recovery mode. 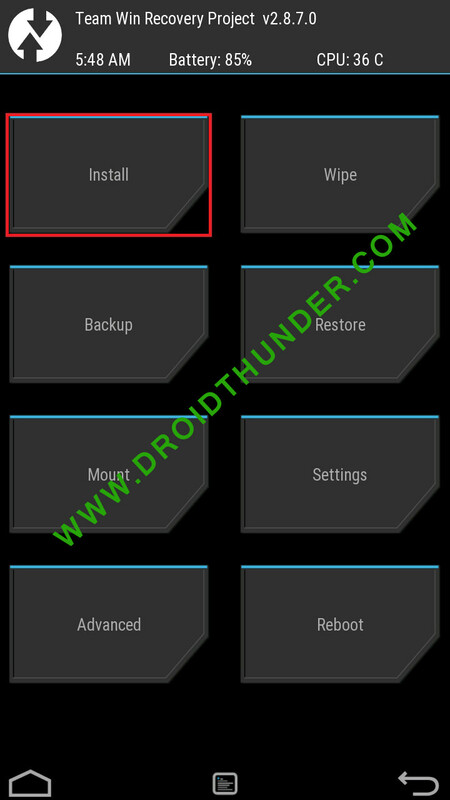 As you enter the TWRP recovery mode, the first thing you need to do is take Nandroid backup of your current ROM. Note: This step will wipe all the data present on your internal memory. So backup everything before performing this step. Step 9: Again go to the main menu and select Wipe option. Then swipe right to initiate the wiping process. Step 12: Let’s initiate the actual Android Pie flashing process. For that select the Install option from the main menu. 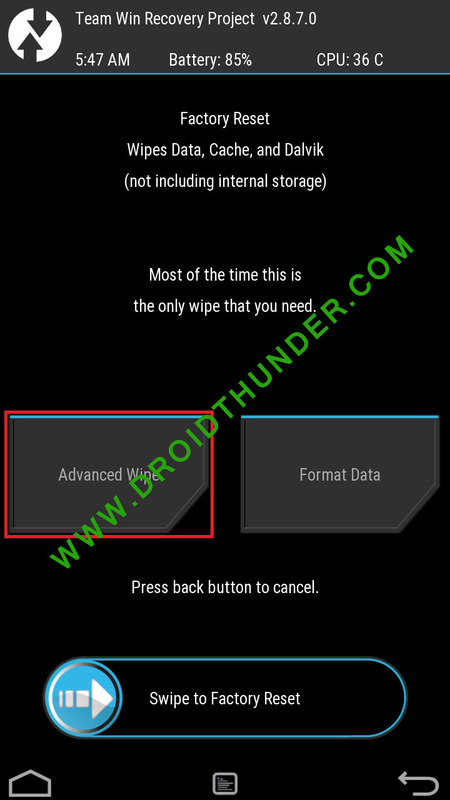 This will show you all the files present on your phones memory. Step 13: Now search for the Lineage OS 16 ROM which you’ve copied earlier and select it. On the next screen just swipe right to initiate the actual LineageOS 16 ROM flashing process. Step 14: Wait and be patient until the flashing process completes. It will hardly finish in few minutes. As soon as it completes, you’ll see the successful message on the screen. Step 15: Now go back and flash the Google Apps package (containing Play Store, Gmail, Gtalk etc.) in the same way as you’ve installed the Lineage OS 16 custom ROM. Step 16: The flashing process completes here. 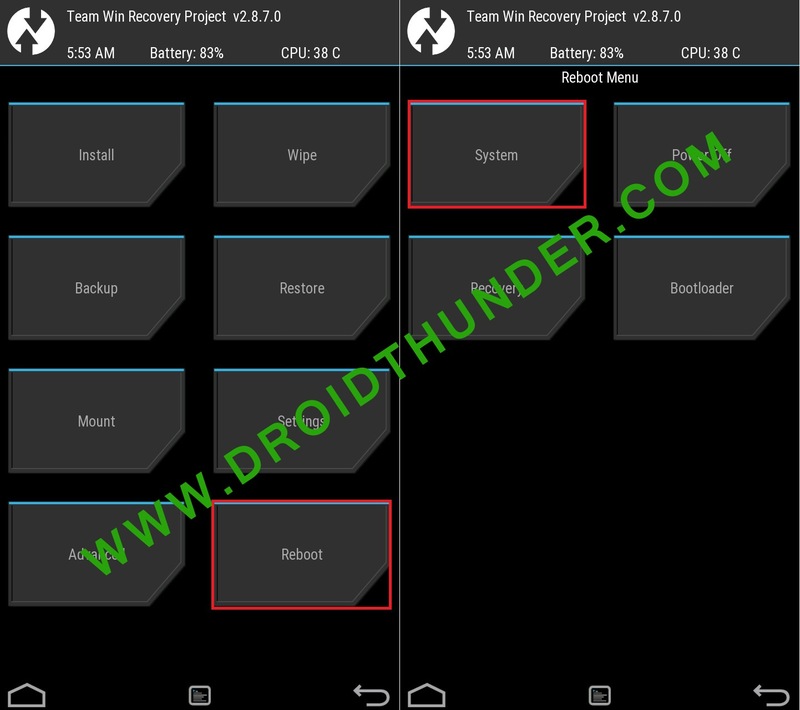 Just restart your device from Reboot » System option present on the TWRP recovery mode. 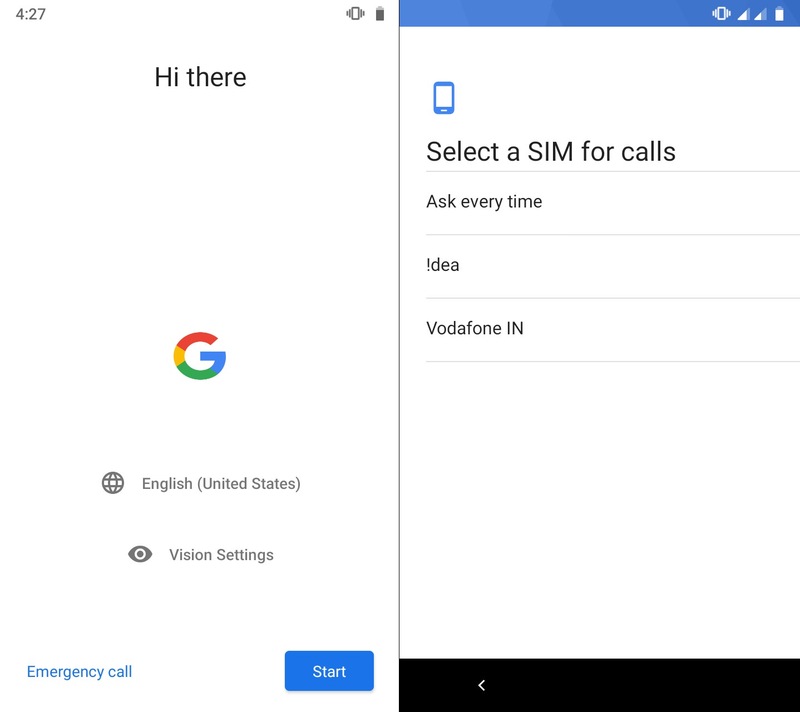 Step 17: As your phone starts, choose language and the sim card for taking calls. 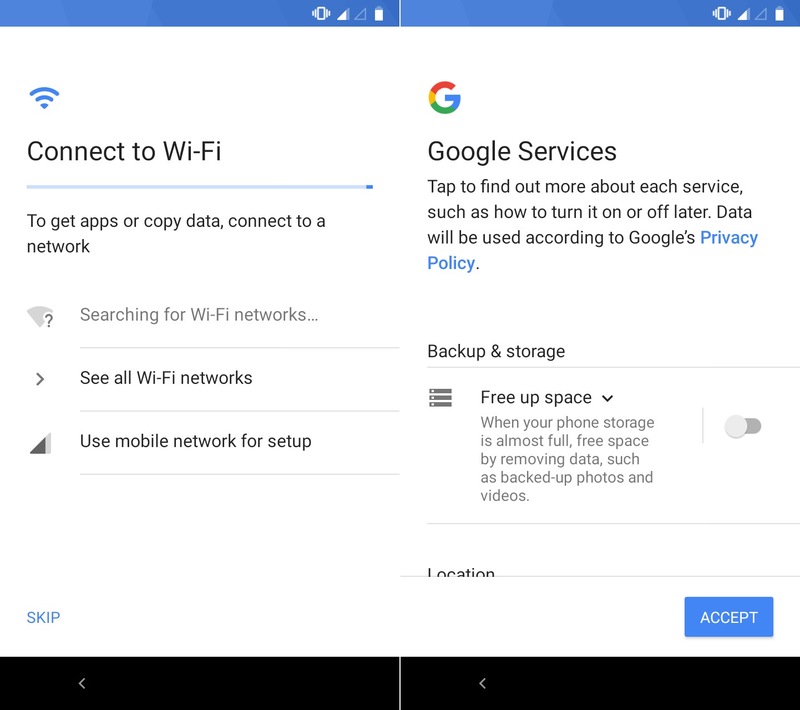 Step 18: On the next screen, connect to WiFi (or you may skip) and accept the Google Services. Step 19: That’s it! Your Moto G 4G has booted into the all new Android 9.0 Pie update. Great! You have successfully flashed the latest Lineage OS 16 custom ROM based Android 9.0 Pie on Moto G 4G (Moto G 2014) smartphone. To confirm that, go to Menu » Settings » System » About Phone. Don’t forget to share your views and experience after using this awesome ROM. And finally if you face any issues while going through this process then freely contact me through the comments section. Till then keep smiling and Peace out!